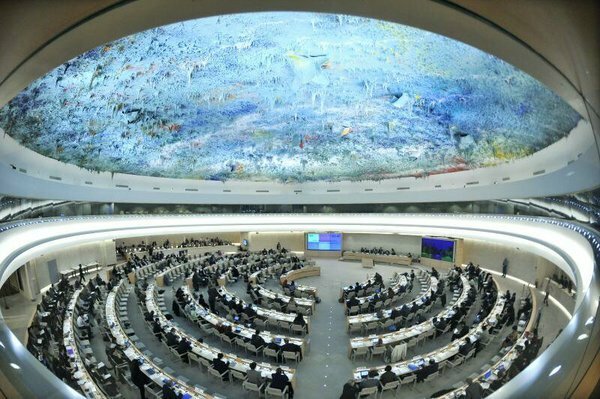 On 16 March 2016, the UN Human Rights Council adopted the outcomes of the Universal Periodic Review of Mauritania, in a session marked by divergent views regarding the country’s human rights records. While several African countries supported Mauritania’s alleged improvements, NGOs present at the session intervened to shed a light on the real situation on the ground. Aiming to raise awareness of the abysmal gap between Mauritania's official discourse and the lack of political will to implement the UPR recommendations, the Unrepresented Nations and Peoples Organization (UNPO), in collaboration with the Nonviolent Radical Party, Transnational and Transparty (PRNTT), convened a side-event at the UN in Geneva entitled “Slavery in Mauritania: Abolished in Theory, Present in Practice. Mr Hanno Schedler, from the Society of Threatened Peoples, opened the conference by providing the audience with an overview on the current human rights situation in Mauritania, especially that of the Haratin community. Following Mr Schedler’s opening remarks, speakers Mr Ahmedou Dieng, member of the Permanent Council of the Forces Progressistes du Changement, Mr Diko Hanoune, Secretary General of the Association des Haratines de Mauritanie en Europe (A.H.M.E), and Mr Abidine Merzough, European coordinator of the Initiative de Résurgence Abolitioniste en Mauritanie (IRA-Mauritanie) addressed the practice of slavery in Mauritanian and how its government's claim to oppose it is merely lip-service. Throughout the event, panellists debated the context of the country, starting with the issue of the returnees. Between 1987 and 1992, the Mauritanian government decided to deport a large number of black Mauritanians to its neighbouring countries such as Senegal and Mali, with the objective to establish an Arabic Mauritania and eradicate the black population. Although the government has changed its policies since then, the logic of caste-based superiority and consequent discrimination between the ethnic groups more than never permeates the country’s social fabric. In this context, the issue of lack of political representation was addressed by Mr Dieng, who reminded that in the Mauritanian Ministry, there are 28 ministers of which only five are black. “Injustice everywhere is a threat to justice everywhere”, he concluded. In light of the failure to implement the ‘Roadmap to Combat the Consequences of Slavery’, panellists highlighted the lack of political will to address the problem or at least to admit its existence. Not only high government officials have publicly denied that slavery still exists in the country, but also have continued to persecute anti-slavery activists, most notably Mr Biram Dah Abeid, President of IRA-Mauritania. The conclusion of the side-event, that the dire situation of the Haratin demands growing international awareness, was reinforced by the positive reaction that the adoption of 142 of 200 recommendations of UPR of Mauritania triggered among some members states, which praised Mauritania's alleged progress.